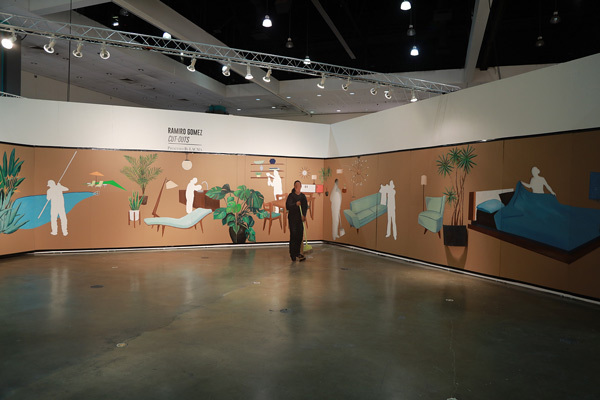 The Cut-Outs installation piece, an 8 x 73 foot acrylic on cardboard mural, deals with scenes from Gomez’s West Hollywood neighborhood. Gardeners and pool cleaners tend to the outside, then the mural proceeds inside, depicting housekeepers cleaning the living room, dining room, the bathroom and finally, the bedroom. Playing with negative space and with perspective, Gomez has life-sized cardboard figures emerge from the body of the mural, standing alone in the space, confronting the viewer. The piece functions as a still-life of affluent Los Angeles. Artist Ramiro Gomez’s (b.1986 San Bernardino, CA) life-sized cardboard figures make visible the “invisible,” the predominantly Latino workforce serving the affluent areas of Los Angeles. His subjects are the nannies, gardeners, housekeepers: the people behind our images of luxury. Gomez is himself the son of working-class Mexican immigrants. He grew up in San Bernardino County, east of Los Angeles. He left the California Institute of the Arts before finishing and went to work as a live-in nanny in Beverly Hills, where he keenly observed the relationships between heads of households and their staff. Gomez found the dynamic between family and staff to be paradoxical – at once intimate, trusting and close, but also prone to abrupt dissolution for various reasons. His experiences as a nanny and as a son of immigrants provide the impetus for his work.